A staple of any relationship that you share with a canine companion is "the walk". Walking is a time for you and your dog to be on the hunt together, taking in the smells of the neighborhood (or park, or woods, or wherever) and enjoying your experience of the world in all its stimulating-your-emotions glory. Yet for many of us, walking with our dogs is a struggle of excess: too much stopping when we want to go, too much going when we want to stop, too much jumping on people, too much pulling, etc. The nerve of our dogs, having their own agenda when we're out trying to get some walking done! In this article we're going to talk about how to cure the struggle, which is actually simpler than you might think - because it's all about your focus and expectations when you're walking together. Step #1: Focus. When you walk with your dog, actually focus on your dog. This is your time to be TOGETHER - in other words, if you have an ambitious agenda of things to do in a definite amount of time, then consider leaving your dog at home. Our dogs actually benefit from down time - they don't have to go everywhere that we go in order to be happy. In fact, the happiest dogs are probably the ones who experience clearly structured days, with "off" time to chill out (the majority of the time) and "on" time when they are actively engaged in "hunting" activities (walking, playing, or training). during the "on" time, you want your dog to experience the most emotional satisfaction possible, and the only way that's going to happen is if you give them your attention during those times. Step #2: Play. Remember how you're trying to be the moose in your dog's life? Your dog is constantly out in the world looking for prey objects as a means to resolve the stress that they're carrying around within them (or the energy that revs up when they encounter whatever triggers them in their environment). When you harness your dog's prey instinct, they learn that YOU can satisfy their desire to make prey on the world - therefore when they're out in the world and they feel that "I gotta find some prey" kind of feeling, they will automatically look to you for resolution. So while you're walking together, on the hunt together, be prepared to resolve your dogs energy through play and training. Have a tug toy handy, and tease your dog with it - getting your dog to chase you for portions of your walk. Change direction a few times, then let your dog bite and tug on the toy, letting them win (of course) and carry the toy for a little while. Incorporate the technique of pushing into your walk as well. Use it on its own as a way to keep things interesting, and use it (or the tug of war) as a way of redirecting your dog's energy when the world throws something their way. Again, your challenge is to keep the walk interesting for your dog - in the process it'll probably stay fun and interesting for you as well. You can also incorporate any of the training that you're doing into your walks. I'll be showing you how to work in the obvious (heel) and the not-so-obvious (down/stay) as we get further into training techniques. The one IMPORTANT thing to remember is to keep things a-moving. Your walk should be energizing, so if you sense that for whatever reason your dog is shutting down, that probably means you're doing too much "training" and not enough hunting. Step #3: Manage. Until your dog walks easily on a lead, find an easy, non-invasive on-lead management technique and use it when it's important to keep your dog walking at your side. Note - it's not ALWAYS important to keep your dog walking at your side. Management techniques are NOT a subsitute for training, but they will allow you to control your dog when the need arises, and as long as you focus on a positive management technique it will at a minimum reinforce the lessons you're trying to teach your dog about how it really feels GOOD to be walking at your side. So if your management technique is causing your dog to shut down emotionally or creating conflict between the two of you - switch to another management technique! With these three steps, you should be able to transform your walks with your dog into time together that you both enjoy. The most important thing to remember is that until your dog is well trained (and even afterwards) your walks together should be primarily about satisfying your dog's deepest desires - their need to hunt and satisfy their prey instinct. If you're too focused on the errands you have to run or the socializing that you want to do, consider leaving your dog at home, where they can have some structured chill-out time. You'll get more done in less time, and then you'll be able to take some of the time that you saved to give your dog what they really need - quality attention. I'm glad you pointed out the fact that when you walk a dog who hasn't been trained to heel, or even not to pull, you have to be able to focus on the dog during all of your walks with him. I always tell my clients that until the dog is trained EVERY WALK IS A TRAINING WALK! Also, I work in New York, and I see people taking their dogs with them everywhere, talking on the cell phone, not paying any attention to what the dog is doing until the dog is desperate to find an outlet for his energy and so he "misbehaves." Then these owners are quick to pay attention! Only it's always the wrong KIND of attention -- a lot of yelling and scolding. If these people would read your blog their dogs would be a lot better at walking nicely on the leash. I absolutely agree with you about every walk being a training walk. 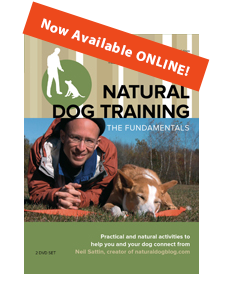 In a sense you could even generalize and say that every interaction is a training interaction - and fortunately in the Natural Dog Training world that leaves the door open to a broad spectrum of activities that qualify as "training".